Earlier, we talked about the fact that axially symmetric orbitals can mix together to produce new combinations. In HF, we looked at the overlap of the 2s orbital on fluorine with the 1s orbital on hydrogen. However, one of the 2p orbitals can lie along the bond axis and share axial symmetry with the hydrogen 1s orbital. We will call this fluorine orbital the 2pz orbital. We could just as well label it px or py, but many people refer to the p orbital along the bond axis as the pz. Note that the 2p orbitals that are perpendicular to the bond axis can't interact with the hydrogen 1s orbital. Because the bond axis crosses the p orbital at a node, where the p orbital changes phase, the hydrogen atom can't form either an in-phase or out-of-phase combination with this p orbital. It would actually be in phase with one part of the orbital and out of phase with the other. 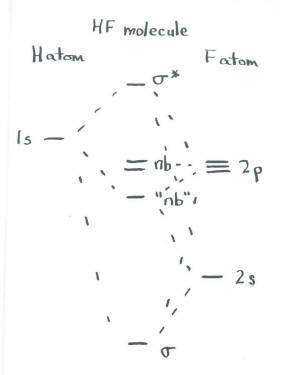 Instead, these orbitals simply do not interact. The hydrogen 1s can combine with the fluorine 2s and the fluorine 2pz. Now there are three orbitals that may combine. They will produce three new orbitals. We should consider these three orbitals together. What different combinations can they make? The orbitals could all be in phase -- that is, the 1s of hydrogen is in phase with the 2s of fluorine, and also in phase with the part of the 2pz that overlaps with it. This will be a low-energy, bonding combination. The orbitals could be completely out of phase. The 1s of hydrogen is out of phase with the 2s of fluorine, and also out of phase with the part of the 2pz that overlaps with it. This will be a high-energy, antibonding combination. The third combination is a little more subtle. The other possibility is that the 1s orbital of hydrogen is in phase with one orbital of fluorine, but out of phase with the other. However, that means it could be in phase with the 2s but out of phase with the 2pz, or vice versa. That means there are two more combinations, for a total of four. However, since we are using only three atomic orbitals, we can produce only three molecular orbitals. These two possible combinations must be mathematically reduced to one, somehow. A third combination will be partially bonding and partially antibonding. This combination will be somewhat like a non-bonding orbital (although its exact energy may be slightly stabilized or destabilized with respect to the original atoms). Once again, mixing that occurs based on symmetry has some quantitative effects on the energies of the electrons, but in this case the qualitative effect is a subtle change in the ordering of energy levels.